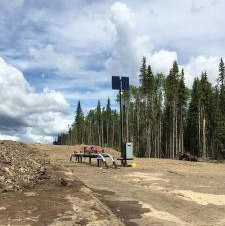 Simark Controls Ltd., a subsidiary of SFC Energy, has received a new EFOY Pro fuel cell order from a new major energy customer: The Canadian oil & gas producer will use the fuel cells to power their off-grid control and monitoring equipment throughout Canada. The order amounts to approx. CAD 0,4 million. Brunnthal/Munich, Germany, November 27,2017 – Simark Controls Ltd., a subsidiary of SFC Energy, leading provider of hybrid power solutions to the stationary and mobile power generation markets, has received a new EFOY Pro fuel cell order from a new major energy customer: The Canadian oil & gas producer will use the fuel cells to power their off-grid control and monitoring equipment throughout Canada. The order amounts to approx. CAD 0,4 million. In the past, the oil producer had to use standalone solar modules or thermoelectric generators (TEGs). Both technologies have serious disadvantages in cold temperatures and harsh weather conditions which can result in power interruptions and system downtime. SFC’s hybridized solar/fuel cell power systems eliminate these reliability issues and provide a robust streamlined solution for dependable 24/7 asset operation regardless of weather conditions. Simark delivers the EFOY Pro fuel cell in a variety of fully integrated plug & play hybrid solutions, engineered to customer specifications. Top sellers in the Simark portfolio are customized EFOY ProCabinets for stand-alone operation of remote SCADA, wellhead or telecommunication tower equipment, and mobile EFOY ProTrailers for security, surveillance and public events applications. Additional information on SFC Energy’s off grid power portfolio for security & safety, oil & gas, wind, traffic management, environmental and telecommunications applications at www.sfc-defense.com, www.efoy-pro.com and www.sfc.com. Additional information on Simark Controls at www.simarkcontrols.com. Simark Controls Ltd., a company of SFC Energy AG, is a service oriented, value added sales company specializing in custom integrated and manufactured solutions of high quality instrumentation, automation, energy and power products. Simark provides instrumentation & measurement systems, power components & drives, security & surveillance equipment for the oil & gas industry and mining, forestry & community supply markets. Simark is headquartered in Calgary, Alberta, with sales offices in Edmonton and Grande Prairie, Alberta, Saskatoon, Saskatchewan, Vancouver, British Columbia and Montreal, Quebec.